Cardiff City vs Liverpool, EPL 2018–19 Live Streaming Online: How to Get Premier League Match Live Telecast on TV & Free Football Score Updates in Indian Time? Arsenal vs Crystal Palace, EPL 2018–19 Live Streaming Online: How to Get Premier League Match Live Telecast on TV & Free Football Score Updates in Indian Time? Loss of any kind of pet is a grief-stricken situation for any pet owner. 75-year-old Keith Allies is left in tears as his longtime companion, a goldfish named George has left him. 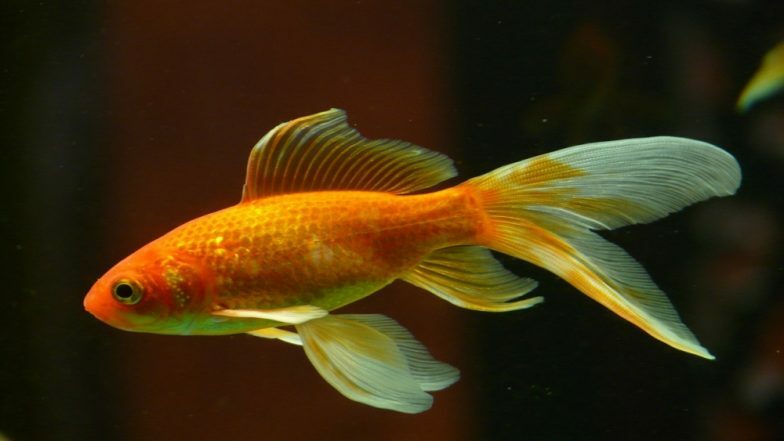 George was Britain's oldest goldfish and he was 44 years and could barely swim before he passed away. It was a fish that Keith Allies had won at a funfair back in 1974. He had presented the goldfish pair to his girlfriend, now his wife Mary. But George bet the average lifespan of a goldfish by almost three decades! Fish With Pigeon Head Found in China, Watch Video of The Weird Looking Mutant Species! The owners now can't hold back their tears as they bid a final goodbye to their lovely companion. They buried him in their back garden. Mary Allies was quoted to The Sun, "He was part of the family. I saw him struggling as he swam around the fishbowl." The fish had managed to survive through the couple's house moving and even the birth of their daughter. Granny Dakshayani, India's Oldest Elephant in Captivity Passes Away in Kerala at 88. Two goldfishes George and Fred were a pair won in a funfair and Keith gave it to his girlfriend Mary. The couple got married 5 years later and since then have been looking at the pair. Fred passed away two years ago at the age of 42. Soon after Fred's death, George too became ill and for nearly a month ago before he passed away, he struggled to swim. The distinct orange colour of the fish was also fading and it appeared to be silver towards the end. Seeing George going so strong, the couple even wondered if their pet will outlive them. 62-year-old Mary also said, "We didn't think they would last a few years - let alone 40. We started to believe we'll be the one's to go first." The couple also had many people telling them they were probably owners of the oldest goldfish in Britain and possibly the world. The couple mentioned that a healthy diet and regular water changes worked in favour of their pet fishes. It is indeed incredible that a prize turned into such a long and beloved companion for this couple.